Management at Sydney's iconic Establishment Hotel saw the coming tablet revolution earlier than most in the hospitality industry, and entrusted Further Ventures to provide an App solution to hit the iPad2 launch date in 2011. Since then, Establishment's parent group Merivale continues to grow and innovate Sydney's hospitality scene. 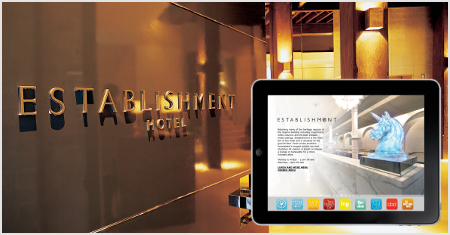 With their expanding F&B offering, it made perfect sense to put Establishment Hotel onto Compendify, our versatile iPad App solution. We rebuilt Establishment's Apps in Compendify around a new structure, consolidating the in-house venues into a single App, and adding new F&B outlets to the Bar and Restaurant guides. The flexibility of Compendify meant we could keep all the existing customisations too, like design tweaks and special Apps to link out directly to the group's other web content. When the F&B outlets underwent a major rebranding in 2018, it was a simple matter to update the Apps. No changes were required on the ground, and the Apps functioned seamlessly. And as operations proceed, our custom tracking system raises an alert whenever any venue details are changed on the website, such as opening hours. The updates are reflected in the Compendify Apps, meaning the information is always current, all without hotel management or staff lifting a finger! You can find the Compendify website here for more details.